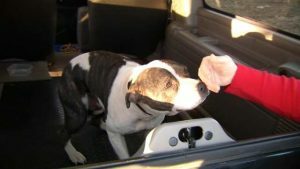 Why do some dogs bark and lunge at people and dogs when confined inside the car? There are several possibilities for this reactive behavior to develop. For example, genetic protection gene, learned behavior, fearful response to stimuli, unpleasant association within the car, or just poor emotional control to name a few. 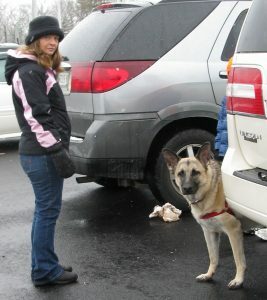 This blog will focus on how to change your dogs response when in the car. 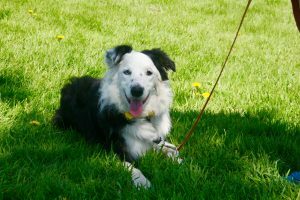 Some breeds have a genetic trait for guarding or protection, which can effect the results of a behavior modification plan. 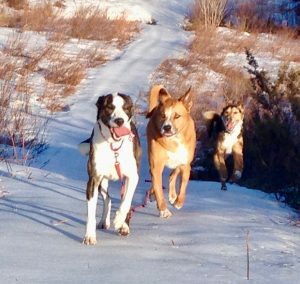 In other words, “The persistence of such breed-specific behaviors as herding, pointing, tracking, and hunting in the absence of training or motivation suggests that these behaviors are, at least in part, controlled at a genetic level[34,35]. ” Rigterink, Amanda, et al. 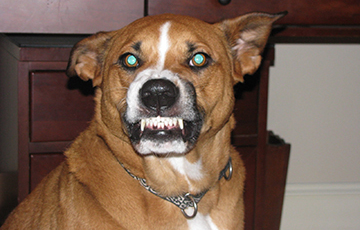 “Genetics of canine behavior: A review.” World J Med Genet 4.3 (2014). Therefore, some dogs may never be 100% free of their response. My Recipe is broken down into three areas of focus. 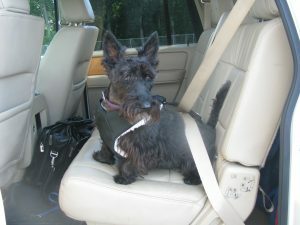 Relaxation, teaching your dog to be truly relaxed when confined in the car. 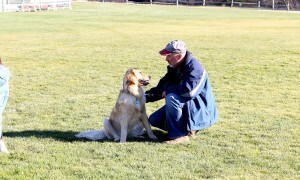 Management, is a necessity, to your dog’s success. Conditioning, changing how your dog feels about a person passing your car. Relaxation Training sessions between 5-10 minutes several times a week in a low distraction environment are best. The secret to a bomb-proof behavior, is consistently rewarding the wanted behavior and not the unwanted behavior. Daily repetition is best. The purpose of this exercise is to teach your dog to relax, even in highly distracting and stimulating environments. Relaxing is not typically a skill we think to teach to our dogs, and yet it is extremely helpful to have a dog that chooses to lie down and relax, regardless of their surroundings. This is highly recommended for the dog with poor impulse control! Get a pocket full of bite sized treats, leash your dog, go to a quiet, low distraction environment and sit down in a chair or on the floor. Reduce your dog’s movement by wrapping it around your waist, or tethering it to a piece of furniture. 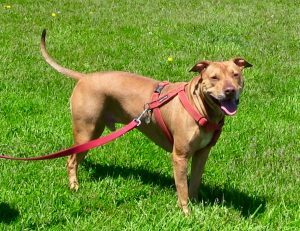 The leash should be long enough that your dog can lie down comfortably and take a couple of steps, without being so long that he can wander off and find something else to do. Make sure there is nothing highly distracting in reach, such as toys or chew bones. Before beginning the exercise, practice some human Zen on yourself! Your dog will not be able to relax unless you are relaxed. Loosen your body and slow your breathing down. Settle into a relaxing position parallel to your dog. 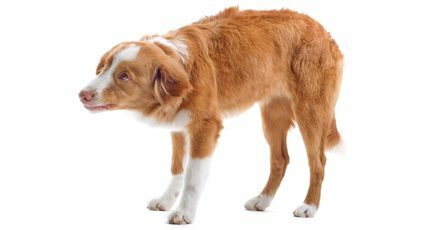 Put a treat to your dog’s nose and lure him into a down position by dragging the treat slowly to the ground. Release the treat for your dog when he is lying down, feed him 2-3 small treats while he is lying down. Don’t ask your dog for a “down” cue, just lure him. We want to teach your dog to lie down and relax on his own, not because we have asked him to. Most dogs will get back up again right away; repeat the process of luring down to the ground a few more times, continuing to reward the dog for lying on the ground. Don’t correct your dog for standing back up, wait a minute to see if he lies down on his own, if not, lure him down again. him to do. 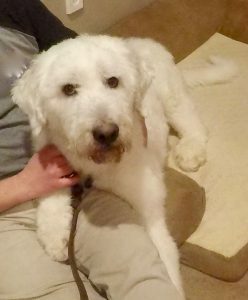 He may bark, or try to get your attention by pawing at you; stay relaxed, ignore any fussiness and wait him out! Eventually, your dog will get bored and lie down. This may take a few seconds, or up to a few minutes. As soon as he lies down, slowly and calmly deliver several more treats. Continue this exercise for a few minutes, calmly rewarding your dog every time he lies down using your voice, massaging or food. If he stays lying down, continue rewarding him slowly and steadily. End the session after a few minutes. Management, means changing the environment so your dog is not going to be put in a situation that triggers his unwanted response or pushes him over threshold. As any new negative experiences will simply make his behavior worse. It also means preventing him from practicing unwanted behaviors. 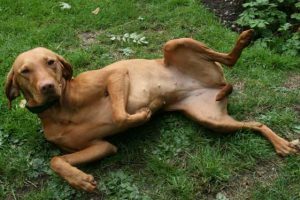 Management is not training, however, training will take much longer (or may not happen properly) if, during the process, your dog is continually placed in situations that push him over threshold that cause his high aroused unwanted behavior. 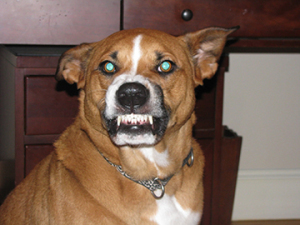 Good management should be practiced while you train/desensitize your dog. 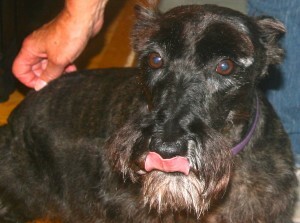 This scottie is at threshold, note the stiff body, hard eyed stare, tightly closed mouth. She needs her environment to change or she will be over threshold and react. state of mind to a reactive or shut down one. This looks different for each dog but can be observed as a refusal to eat food, vigilant staring, barking, growling, lunging, snapping, shaking, or the inability to respond to a well known behavior. Learning occurs best if the dog is below their threshold. 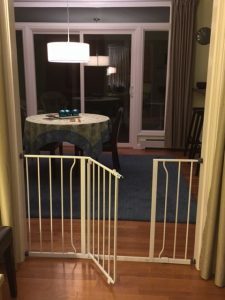 If you find your dog in a situation where he is over his threshold, immediately adjust the situation (i.e.by asking the stranger to leave and come up with a new plan. Have the dog ride in a covered crate that he has been conditioned to. Cover car windows with wax paper to reduce the inducement of the response. 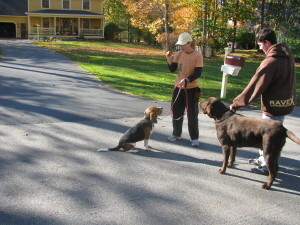 Calming caps and snug thunder shirts can be worn by some dogs, after conditioning. Park away from foot traffic. Leave the dog home when you know you cannot avoid people near your car. 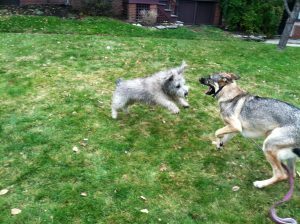 Training includes Classical Conditioning and Desensitization Classical conditioning is an approach where we pair something that created an unpleasant response with something highly rewarding to the dog, often food or toy play. Desensitization means to make less sensitive. Its goal is to eliminate or reduce the exaggerated, response. Desensitization is exposing an animal to a weak, less threatening version of the thing he fears or dislikes. We weaken the thing(person) by making it smaller, slower, shorter lasting, farther away, less noisy, or still rather than moving. Over time, as the pet habituates at that low exposure, we gradually make the trigger, (person) stronger, for example, bringing it closer, increasing its volume or having it move. So a systematic desensitization plan starts with exposure to the least scary version of the feared thing and gradually moves to stronger versions until full or normal exposure is reached. Start your CC/DES program with your dog out of the car, this will set your dog up for success as he will be below threshold and in thinking brain. Have a person walk by at a distance that your dog notices them but is not showing signs of stress. 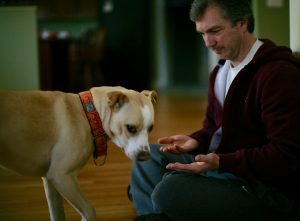 Reward your dog with a treat for noticing the person. Repeat this process of exposing your dog to the trigger and rewarding with high value food. Once your dog is able to sit calmly while a person walks past, then you can start training your dog in the car, but with the door opened, so the dog does not feel trapped. Repeat the process of CC/DES until your dog is able to sit calmly in the car with the door open while the stimuli walks past. If at any time during your training, your dog stops eating, or begins to show signs of nearing his threshold, then slow the progression down and take a step back in your training. This is your dogs way of saying I am not comfortable with the current situation. With your dog in the car and the door closed, keep the window open half way. Allow the person to walk past at a distance while you reward your dog for remaining calm. As this person gets closer to your car, you can have them toss high value treats in the car window. With each training session, I suggest you start with your dog way below threshold as this is beneficial to your dogs success. 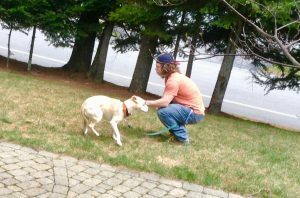 By pairing food with a trigger at a sub-threshold distance (a distance where a dog has little or mild to no response) we are getting the “looking forward to” instead of the aggressive response. 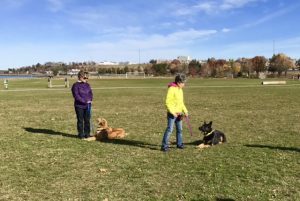 This process is also known as conditioned emotional response (CER) and the purpose is to change the complete emotional response towards something that was considered to be unpleasant to the dog before. 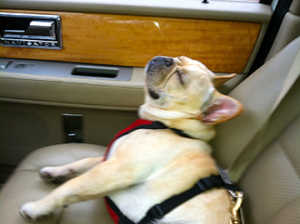 Core characteristics will prevent some dogs from reaching this level of relaxation, but all dogs can be conditioned to feel calm and physically settle in a car when people are passing. The only way to control car aggression 100% is to never take your dog in the car. 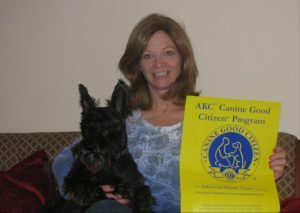 For many, that is unthinkable as we enjoy having our dogs with us. So if your dog reacts in the car, first, teach your dog to relax in your home and other environments including your car with no distractions. Again, this is hugely helpful for the dog with poor impulse control. While you are teaching your dog to relax be sure to use management, so your dog is not practicing this unwanted behavior. 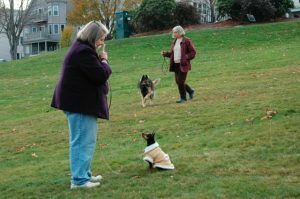 Train your dog to have a different response using a systematic approach of classical conditioning and desensitization. Finally, be realistic about how much progress you hope to make. No one said it is easy to change a dogs response, but imagine if you lower your dogs reaction by 20% in 30 days of training. How about the idea of 50% reduced reaction in 60 days of training. With this recipe, I hope you get started today!